Have you ever stayed up late at night staring at Mercedes-Benz’s line-up of SUVs, wondering if there’s room for another model between the GLA and GLC? 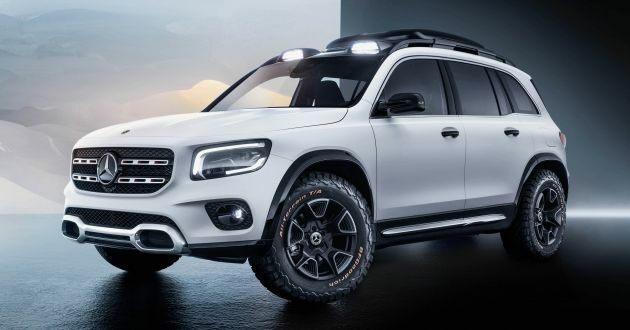 Well, the German carmaker has asked itself that exact question, and has come up with this, the Concept GLB. 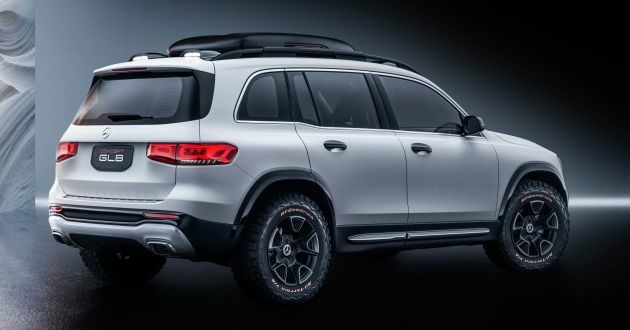 The SUV concept is making its debut at the ongoing Auto Shanghai, and serves as a preview for a series production model that will come later on. However, while it may be labelled a “concept,” a good percentage of the vehicle certainly looks pretty much production ready, at least to our eyes. According to Mercedes-Benz, the Concept GLB places emphasis on spaciousness and robustness, and the figures certainly seem to suggest that. Dimension-wise, the GLC measures 4,634 mm long, 1,890 mm wide, 1,900 tall (including the roof box) and features a 2,829 mm wheelbase. The GLA is obviously a lot smaller (4,417 length, 1,804 mm width, 1,494 mm height, 2,699 mm wheelbase) by comparison, but when matched up against the GLC (4,656 mm length, 1,890 mm width, 1,638 mm height, 2,873 mm wheelbase), Mercedes-Benz’s claims of the GLB having “compact dimensions” are a little curious. These dimensions are factored into the vehicle’s styling, which certainly provides it with quite some presence. At the front, the upright grille sports double louvres in a design that isn’t unlike what you’ll see on the GLA. Flanking the grille are Multibeam LED headlamps with light bar signatures in the corners of clusters. Moving down the sides, the GLB’s muscular shoulder meets up with a rising beltline, the latter with a slight raise near the C-pillar. From the side, you’ll note the vehicle’s short overhangs, generous wheelbase and large window areas. Those 17-inch two-tone wheels are meant to illustrate the SUV’s rugged nature, along with LED spotlights and black roof rails. At the rear, you get more of the sense that this is just a GLC with the corners pushed out, as the vertical rear window suggests. Even the taillights bear some resemblance to those on the latest GLC, with similar graphics and a two-piece setup that is part of tailgate. A “cute” touch on the concept is the four baby exhausts hiding within each of larger outlets. Focusing on the GLB’s meat and potatoes, the interior, we find a dashboard layout that’s rather similar to other Mercedes-Benz compact cars like the A-Class, CLA and B-Class. The Mercedes-Benz User Experience (MBUX) with its large widescreen is ever familiar, as are three central air-con vents. Unique GLB touches include the off-road-type tubular elements in milled aluminium can be found on the lower part of the dash, door handles and sides of the centre console. On the concept, chestnut brown is the predominant colour tone, with open-pored walnut used in other areas. Of course, Mercedes-Benz’s application of materials isn’t in question here. What’s more important is the practicality that it’ll offer, and things appear to be promising. For instance, the company says the GLB will be its first compact model with third-row seating, so up to seven people can get in. Those rearmost seats can be folded following a 60:40 split, and can be recessed flush into the load compartment. As for the middle seat row, it’s 40:20:40 split-folding, and is fore-and-aft adjustable by 140 mm – 90 mm to the front and 50 mm to the rear. Additionally, a total of four child seats can be attached in the second and third seat rows. In terms of what’s going on under the bonnet, the GLB is powered by a M260 2.0 litre turbocharged four-cylinder engine, which offers 221 hp (224 PS) and 350 Nm of torque. The engine is paired to an eight-speed 8G-DCT dual-clutch transmission (also used in the B-Class), with 4Matic all-wheel drive in tow. With how currently Mercedes Malaysia is exploiting it’s customers to the max, they will surely bring in the lowest spec of this as CBU and price it above the GLC RM335k when it goes into production. They will still make record breaking sales in the luxury car segment. Holy…. look at that 1900 mm height and the rest of the dimensions. Makes the GLC looks small. Hmm.. and this thing is supposed to be priced lower than the GLC. Hmmm…. makes me wonder. I think the concept drawings looks better here and yeah it’s interesting to see the GLB have 7 seats while the GLC doesn’t. Love the interior material selection as its not your usual leather selection. There will be customers for the GLB but I think the GLA will look better..and then there’s the B Class which sorta similar to the GLA.